The Ontario premier suggested the upcoming campaign will be vicious. Ontario Premier Kathleen Wynne's speaks at Queen's Park in Toronto on April 11, 2016. Ontario Premier Kathleen Wynne says her Progressive Conservative opponent believes in the same "ugly, vicious brand of politics" as U.S. President Donald Trump. "Doug Ford sounds like Donald Trump and that's because he is like Donald Trump," Wynne said at press conference in Toronto Wednesday. 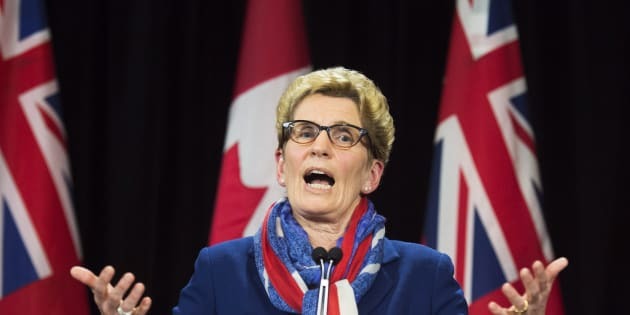 Wynne was asked by reporters to react to comments from the Ontario PC leader that some suggest had shades of the "lock her up" chants some Trump supporters trumpeted against Hillary Clinton in the 2016 U.S. presidential election. At an event in Brockville. Ont. this week, Ford blasted the Wynne government's spending and announced he would call in an outside audit of government finances if PCs win government in the provincial election this June. "If Kathleen Wynne tried to pull these kinds of shady tricks in private life, then there would be a few more Liberals joining David Livingston in jail," Ford said, according to The Toronto Star. Livingston, the former chief of staff to ex-Liberal premier Dalton McGuinty, was recently sentenced to four months in jail for his role in the gas plant scandal. The comment has evidently opened the door for Wynne to directly compare Ford — another pugnacious populist and businessman — to the divisive occupant of the White House. "He'll say anything about anyone at any time," Wynne said of Ford. "Because just like Trump it is all about him. It's not about our people, it's not about their families. It's not about Ontario's success. It is about him." The premier added that she anticipates the upcoming election campaign will be vicious, but said she will fight Ford on principle. "He may be Donald Trump but I'm not Hillary Clinton," she said. Tory MPP Lisa MacLeod has already blasted Wynne's remarks as desperate. Wynne also took to social media Wednesday with a lengthy statement further likening Ford to Trump. She noted how former U.S. first lady Michelle Obama famously urged that, in politics, "when they go low, we should go high." "I liked that idea when she said it. Until we ended up with Donald Trump in the White House," Wynne wrote on Facebook. "So, I'm sorry. But not again. Not here. Not in Ontario. I'm not going to go high. I'm not going to go low. I'm going to call that bullying behaviour out for what it is. I'll fight him on behalf of the people and the principles I believe in. Because he may be Donald Trump. But I'm not Hillary Clinton. And Ontario is not the United States of America." Ontario Liberals have already released a campaign ad targeting the "real Doug Ford," and are planning to focus on some of his past controversial moments, including his public spat with the father of an autistic son over a group home. Yet the party also apologized this week for falsely claiming in a tweet that Ford said he "loves the blacks," reports QP Briefing. Ford has publicly bristled at comparisons to Trump since becoming PC leader last month. But the former Toronto city councillor and mayoral candidate was a big fan of Trump's during the 2016 election, even after the release of the infamous "Access Hollywood" tape in which the Republican boasted of kissing and grabbing women without their consent. In an interview with CityNews in October 2016, Ford said that while some of what Trump's said is "inexcusable," he would not waver in his support. "The alternative is Crooked Hillary," Ford said at the time.